The essay, written by a student at Buist Academy in Charleston, South Carolina, USA, described his experience two summers earlier teaching English in Tamil Nadu, India, motivated by a desire to make a difference in kid’s lives. The story would have been powerful enough if the student had been of high school age, but this was the story of a 12-year-old boy.. I met Vasanth Kuppuswamy, and told him he had a wonderful story and needed to tell it. We agreed he should come to my school and speak to my seventh graders. We arranged for a lunch time presentation that January and the rest is history. As my students watched the slideshow and listened to the story of two schools in the middle of south-central India, they were sad, disturbed, and a little mad. They had never seen or heard anything like this before, of students having to sit on the cement floor for their lessons in classrooms that held 75 children. The classrooms had no chairs or desks. There were few books or school supplies. The class was moved to raise money, which began at $300 and grew to $8,000 before the semester ended. With the funds, the Indian school was able to purchase new desks and benches that summer. School supplies came next, then science equipment and ceiling fans. A wall was built around the school to keep animals out. A year later, the school added a wing for eight grade classrooms. They added a generator, and hired a contractor to build a basketball court. The school even had enough money to buy uniforms for its Scout troop. But that wasn’t all. Vasanth raised additional funds to buy a water system from Water Mission. A Rotarian shipped it to India with the help of OOCL, the company he worked for. Villagers helped assemble the parts sent in four crates and dug a water line from the water tower to the building housing the water system. It was a lot of work, but the villagers and students wanted a clean water supply. All of this took place between 2005 to 2007. 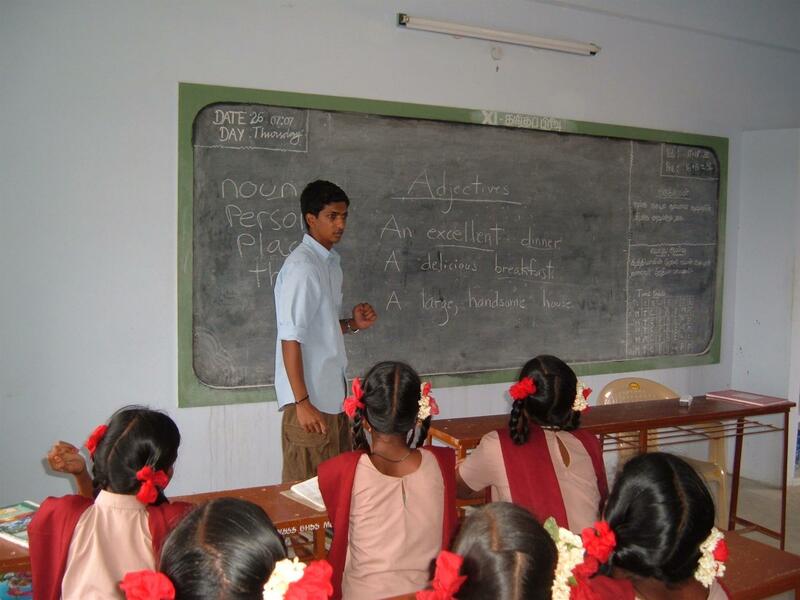 Since then, Vasanth established an after-school exam prep program for 10th and 12th graders so they could pass their country’s national exams and go to college. He added a summer acceleration program for incoming sixth graders. He also bought four acres of land behind the school to continue adding onto the school, began a school library, and assembled a computer lab. About 40 students are now going to college every year. Two Rotary grants enabled Vasanth to provide first aid supplies to 150 area elementary schools and feminine hygiene products for girls in all area high schools. His work has now expanded into providing healthcare for infants through partnering with Healthy Children, Brighter Futures. Four nurses visit the homes of newborns in the area to make sure every child receives the care needed for a healthy start to life. Mothers receive information about nutrition and child-rearing. Vasanth graduates from medical school in May 2017. He will do a residency in internal medicine in the United States for three years and then establish a medical practice where the needs are the greatest. But someday he says he will return to India and build a medical clinic to serve the needs of all the people in this part of India. Why is this project so significant? It was spearheaded by one student who cared enough to give his all, one teacher who shared his dream and became his mentor, six local schools and students in other states who raised funds year after year for each project, and eight Rotary clubs who got behind each project and made them possible. With everyone working together, these projects exceeded everyone’s expectations.